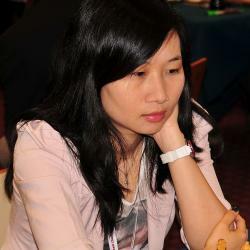 Hoang Thanh Trang is a female Grandmaster who has dual citizenship of Vietnam and Hungary. She climbed her way through the FIDE titles, achieving each title before she had any major tournament successes. This was soon blown away and she began to win major women’s tournaments. Currently one of the top 20 female chess players in the world, she is sure to continue her rise to the top. Hoang Thanh Trang was born in Vietnam and moved to Budapest at the age of 10. She learned to play chess from her father at the age of 4. Trang was a strong player at a young age but didn’t have any early, outstanding successes in her chess career. She became a Woman FIDE Master in 1992, then achieved 3 different titles in one year. She did this in 1995 by becoming a Woman International Master, then a Woman Grandmaster then a full International Master in the same year. Her first major tournament success was when she won the World Girls Junior Championship U-20 section in 1998. She followed this up with winning the Women’s Asian Chess Championship in 2000. In 2005 she played on board 1 in the European Chess Club Championship and won a gold medal for her performance. In 2007 she became a full Grandmaster. In 2013 she won the European Individual Chess Championship for Women tournament. More recently, her rating has dropped below 2500 a bit, down to 2490, but she continues to be a very strong chess player and is currently ranked as the 20th best female chess player in the world.